A new One UND Strategic Plan website, launched in January, provides a one-stop, easy-to-navigate page for visitors to access everything they need to know about the Strategic Plan. Photo by Shawna Schill/UND Today. Angelique Foster has a big job. 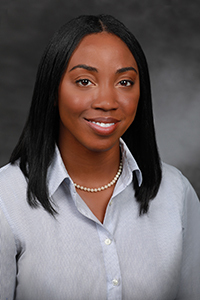 As the Implementation Lead of the One UND Strategic Plan, she’s constantly busy organizing meetings between goal captains and project managers, maintaining a dynamic 5-year timeline, and coordinating all of the little things that would otherwise go unnoticed. But among her most important duties is making sure people – both within the University and beyond – are fully aware of the power of the Strategic Plan’s progress. So she had an idea. 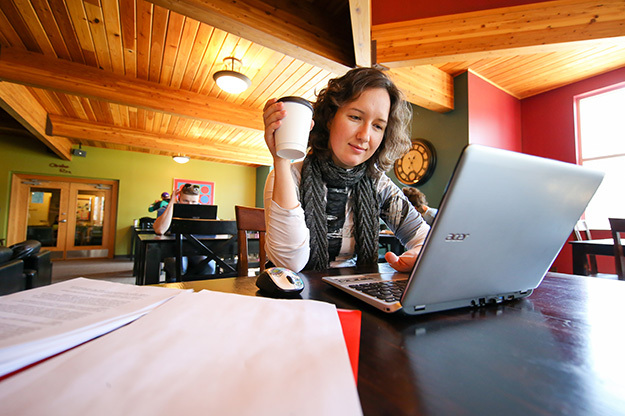 Why not create an online resource to lay out the University’s plan and celebrate its milestones? Foster teamed up with Brandon Beyer, UND Presidential fellow for media relations, to brainstorm what the site could look like, and how it could best serve students, faculty, staff, stakeholders and supporters. Each Strategic Plan goal page offers an explanation of the goal, its recent progress and its metrics for success. They also include detailed information on the goal’s action steps, down to the very way they are measured. The new website, launched in January, is a one-stop, easy-to-navigate page that allows visitors to access everything they need to know about the Strategic Plan. Guests are welcomed by a message from UND President Mark Kennedy. They can then select from a sidebar of options, including a Strategic Plan overview, a dropdown menu of Goals 1-7, quarterly reports and historic information. 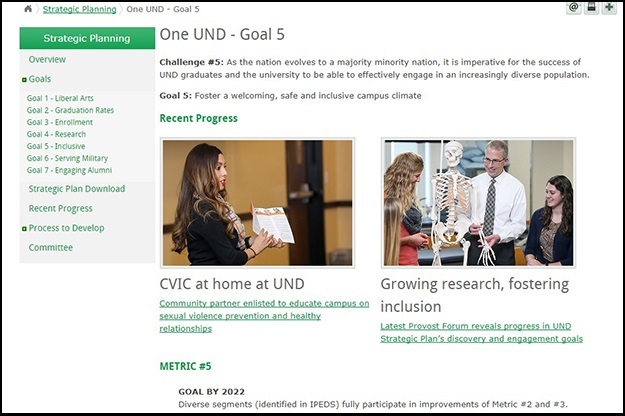 The University’s home website, UND.edu, is currently undergoing a full redesign, making it responsive, mobile-friendly, and more aesthetically pleasing – an investment of Strategic Plan Goal 3. Waves of major updates will begin this April, although smaller updates, like a new events calendar, have already been rolled out. The Strategic Plan website will be an important tool for several audiences. For example, faculty can use it assess how their departments may fit into the plan’s research Grand Challenges, staff can examine how they can use Starfish to enhance retention and graduation rates, and students can see why high-impact practices have become an essential part of their UND experience. But the message needs to be heard beyond the Grand Forks city lines. “The University of North Dakota is a state school, so we not only serve our students, but we also serve our broader community,” Foster said. “By making UND’s advancements clear to the larger community – to our donors, our alumni, our prospective students – our reach is growing, which is what we want. The website will be used in partnership with UND Today to proactively inform the campus community and beyond of the implementation and evolution of the plan. And, although Foster has a full task list to tackle from now until 2022, she’s positive that her team will give her consistent developments to celebrate online.